Your goal in life is to die, so you might as well enjoy life’s journey along the way. That is a dramatic and dark way to start a blog post, I know. But we all share the same beginning and end to life’s journey. We are all born, we do some stuff, and then we die. Our bookends are identical, but the books we write between them are entirely up to us. Is there much joy in your books? You find lasting happiness when enjoying life’s journey. But how can you enjoy the big journey if you don’t appreciate the tiny journeys along the way? They all add up! You will face all kinds of adversity during your life, and some of it will be bad. But it’s during bad times that you must practice finding goodness. In the past, your reaction to those trying times is what made you who you are today. If you are miserable now, it is most likely because you were unable to find the good in a bad situation; instead, you found comfort from the pain. My father sexually abused me as a 10-year-old boy. It’s tough facing that kind of reality, but I learned from that experience. I took the anger away and removed the pain to realize that had it not been for that experience, I would not be the father or person that I am today. My gift from that experience is the exceptional low baseline of what not to do as a father. So, yes, the painful trauma was real in the past, but I am grateful to have had that experience to learn from. While incredibly tough, I enjoyed that life’s journey of healing. I was growing. What’s not to like about growing? 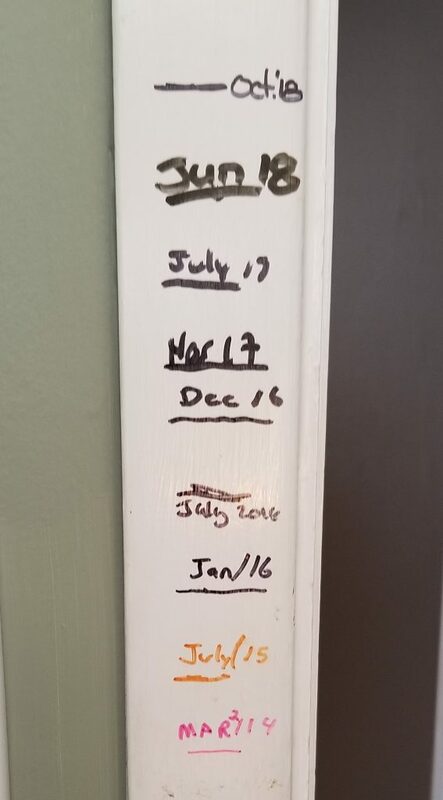 As I sit here writing, I am looking at the door jam marks that we have made of our son’s height over the years. Each mark is about an inch or so of gained height since the last measurement. All I can think of when I see those marks is the joy and happiness my son has had while growing to the next mark. He doesn’t care or realize that he is growing, he is just enjoying his life’s journey. We need to be more like kids. They know how to enjoy the little journeys of life regardless of the parameters we set for them. If you think a child’s life is so easy, realize that they cannot do anything without our consent. They are prisoners to their age. Not much different than what you go through every day as an adult, except you don’t need consent to live and love your journey. Be a child, find and enjoy all of the good within the bad. Right now, you are writing a new book. Is it sad? Happy? Grateful? Is it resentful? Do you even care? It’s not too late. Put an end to this lousy book right now and start a new one today — one of growth from the beauty of this moment regardless of how difficult it may be. Before you know it, the final bookend of life will appear, and you will have no more challenges left and no more books to write. Don’t allow your final life journey to end in a book written about regret.